Doxpop - Tools for Attorneys and Public Information Researchers: Search full text of Recorded Documents! Doxpop has been working to scan through the land records offered by our 42 County Recorder Partners to add tools that allow searching of document text, along with any text entered about that document, including full document types and notes or memo field entries. This means that in addition to the search fields currently offered by our advanced search, you can add information that appears on the document itself. However, this new field is not limited only to the text of documents, you may also use it to search for additional document information that has been indexed on the document, such as a second party when the search results for a single party return too many records. Use this field on its own with a collection of relevant words, or in conjunction with our many advanced search fields. specific document types not listed in the dropdown? multiple names on one document? multiple legal descriptions on one document? personal representative or estate records? Now you can use this additional field to capture additional information and narrow your results. 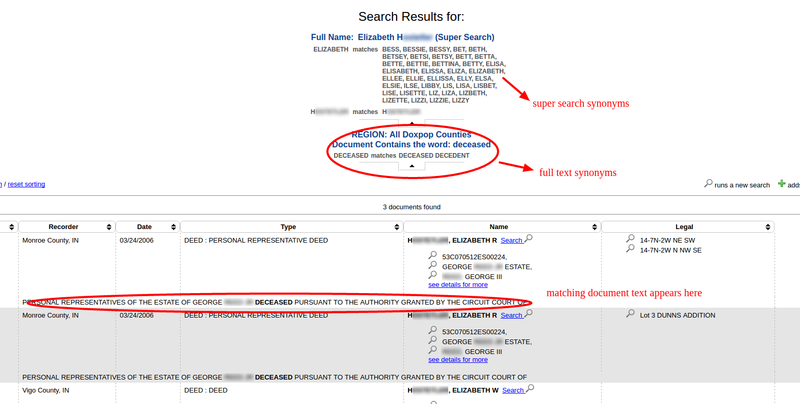 A snippet of the matching text is included with the search results, along with the document record. Search for exact document types to narrow your search quickly. Please note that OCR scanning technology is limited. We can only scan and search documents that are legible to the computer and scanned reasonably well, which means that most historical documents won't return good results this way. But keep in mind that this new field is still using all available data for every document, so it can still add value in this way. If you have a specific use for this field, please comment here or share it with us! We'd love to know how our customers are using this field and how to make it better!